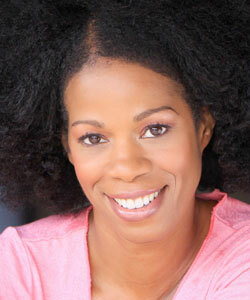 Actress, comedian, producer and writer Kim Wayans is On the Couch with CurlyNikki! A talented member of the famous Wayans clan, Kim shined on "A Different World," and delivered uncanny impressions on Fox Network's "In Living Color." She's also appeared on the big screen with roles in "I'm Gonna Git You Sucka," "Don't Be a Menace to South Central While Drinking Juice in the Hood" and "Juwanna Man," to name a few. But today we're here to take a closer look at them celebrity curls! 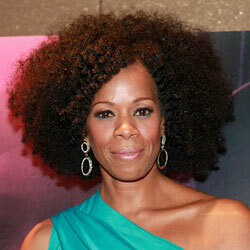 Ladies, I present to you, Kim Wayans! Enjoy! CN: It was so amazing to connect with you on Twitter! I've been a fan since Miss Benita! Kim: Thanks Nikki! I love your website. I read your celebrity interviews and have learned so much about working my natural hair from CurlyNikki.com. It's really a tremendous resource, and whenever I run into a sister with her natural hair, I'm always sure to tell her, "Be sure to go to CurlyNikki.com!" I was just talking to a woman in New York that wants to transition, she's scared, but she wants to, and I told her, "You need to get on CurlyNikki.com and read the stories of women who made the transition because it's going to inspire you and give you the courage to go on and lop that off and start from scratch!" CN:Wow! Thanks Kim! That's such an amazing compliment. I'm happy that you find the info helpful and I'm very grateful for the free pub! Kim: It's an amazing website. My girlfriend Robin Robinson, a die hard CurlyNikki fan, turned me onto it. I had to mention her 'cause she'd be on me if I didn't! 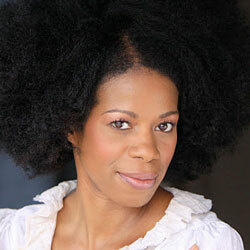 CN: Your natural hair is some of the most luscious I've ever seen atop a celebrity head. Give me your story! Kim: I've never had a perm. My mom didn't have that — we all wanted one of course, because everybody wanted the hair that swung, and this didn't swing [Laughs]. She was very much about loving your natural hair and said to all of us girls that when you turn 18, you can do whatever you want with your hair, but right now, in this household, there's gonna be no perming. So we just had to tie sweaters on our head and swing those from side to side [Laughs]. So I never got a perm and when I left home, I never really wanted one. I would hot comb my hair or wear braids because I really didn't know what to do with my natural hair. I just knew that I didn't want to put chemicals in it. Like back in the day on "In Living Color" and "A Different World," I wore it pressed and then I graduated to braided styles and wore that for many years. And when I got tired of the braids falling out in the swimming pool [Laughter] — you know, you're thinking you're all cute and everything, and then an extension falls out — I looked up and my hair was floating in the pool! A guy was like, "Excuse me miss, I think this is your hair!" So that, plus I was just ready for a change. I didn't want to be a slave to the braids anymore. I just got the urge. I wanted to rock my natural hair without the braids, without anything. CN: What's your current routine? How do you achieve that luxurious curly fro? Kim: I do my hair once a week. I don't use shampoo anymore, that's something I learned from your website. I use DevaCurl No Poo and I find that to be really amazing because it doesn't strip your natural moisture and oils. It works well because it keeps my hair feeling very moist. I also learned that I shouldn't be yanking a comb through this bush and that I should be using my fingers as much as possible. I'm so happy to be talking to you because I've benefited so greatly from your website. It's just a gem. I can't sing your praises enough. As a culture, we don't learn how to do our hair and that's why there's such an aversion to wearing it. That's why so many women are like, "I don't know what to do with it and therefore I perm, or therefore I braid, because I don't know what to do with my own hair." We don't grow up learning how to do our hair, we grow up learning how to do somebody else's hair — Caucasian hair. Those little combs and brushes don't work on this. So you find yourself yanking out your hair and having such a difficult time, and when you learn, you learn that your hair is different and requires different treatment. And when you grasp that and get the proper tools to do YOUR hair, it become a breeze. It becomes fun and not a huge hassle. Kim: It is! It's a total re-education. So back to my routine, now I have a Ouidad Comb. I first use my fingers and go through my hair and separate it into about 5 large braids. And then I saturate my hair with a conditioner, put my little plastic cap on and let that sit in my hair for a couple of hours. If I have errands to run, I'll slap on baseball cap so I can run around. I let that percolate up there for a few hours and if I have the time, I'll even leave it in over night and then the next day wash out each braid, cleanse with Deva NoPoo using luke warm water, and do a final cold water rinse — something else I learned from your site. I pat dry each section with a towel and gently remove excess water. Then I take virgin coconut oil with some jojoba oil and a little raw Shea butter and mix that together and put that on each section, re-braid back into the big 5 braids, put on my satin cap and then I go to sleep to let it dry overnight. I also sleep on a satin pillow case, which is something I didn't know about growing up. It's something else I learned from you, and it just makes such a difference. You wonder, "Why is my hair dry all the time? All the oils and moisture I put in it..." and then you realize the pillowcase is more moisturized than your hair and that's crazy! So that satin pillow case really helps a lot. The next day I let the braids out, lightly take my fingers and work it a little bit and let it do its thing for the rest of the week. CN: What about night maintenance throughout the rest of the week? Do you re-braid? Kim: I put my satin bonnet on it and just sleep. In the morning, I take that off and re-fluff. Some times, if it needs it, I'll take a little more of that coconut oil mix and squeeze it through to give it some extra shine. And that's it! CN: You mentioned DevaCurl. What other brands are you liking? Kim: I love Carol's Daughter Healthy Hair Butter. I also love Jane Carter Solution. She has a Hair Nourishing Serum and a spray, liquid Revitalizing Leave-in Conditioner. I like both of those and use those from time to time. I also love her Nourish and Shine. My hair likes heavier solutions, it's my friend. You put some in at night and by the morning, it's absorbed and your hair feels great. If I want to change up my look, which I rarely do, I'll pull my hair back into a bun. And that's another good thing about the conditioning. If you condition over night, you find that you get a lot more stretch the next day, which makes it easier to pull it back into a little bun. Or, sometimes I'll just do two piggy tails, which is my husband's favorite. He just loves that. I like it too. And that's about it. I'd love to learn how to twist my hair though. CN: Your skin is so clear and smooth. Dish! Kim: Thank you! Coconut oil! If I can't eat it, I try not to use it on my skin. It's free of chemicals. It's also excellent for removing makeup. Lately, I've been doing some publicity stuff for my new film, "Pariah," and coconut oil is wonderful for removing makeup. It leaves me so soft and moisturized afterward. I have very sensitive skin and can't use a lot of products. I love Aubrey Organics, it's an all natural skin care line and I love their cleanser. CN: What's new? What projects have you been working on? 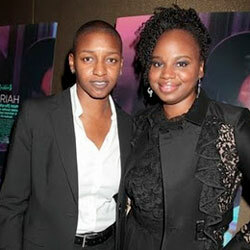 Nikisia Cooper and Dee Rees. Kim: I'm in a film called "Pariah" that I'm really proud of. It opens up the 28 of this month in New York, San Francisco and Los Angeles, and then they'll roll it out to other cities after that date. It's an amazing film. It's a coming of age story about a young lesbian struggling with her identity and I play her mother who is having a difficult time dealing with her sexuality. It's beautifully written and so relevant to what's going on these days. It's good for opening up dialogue and will hopefully help to change some lives. The director is a young, black woman, a protege of Spike Lee who is actually one of the executive producers on this movie. 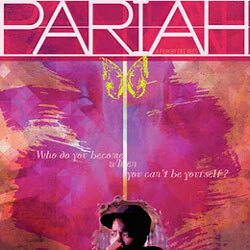 Check out "PariahtheMovie.com" to see a trailer and get more information. We had a lot of fun. We premiered at Sundance this past year and then we went to the Toronto Film Festival as well. Focus Feature bought the film and they're distributing it. The cast is wonderful. It's a portrayal of an African American family in a way that we rarely ever get to see. And you know I really hope people will come out and support this because on so many levels, it's a beautiful film. It's a universal film. You don't have to be gay or black to be affected by it and to resonate with a a lot of the different themes that are going on in the project. Another great thing is that all of the cast is natural, even the director Dee Reese and producer, Nikisa Cooper! So we made quite the statement going from town to town promoting the film. People were like, "Hold up, wait a minute, the naps have arrived!" It was really, really great. I also have a collection of children's books that my husband and I write called Amy HodgePodge. We just got a deal with a production company that is trying to do animation with the project. We have 6 books out on the market right now, published by Penguin, and it's a delightful story about the trials and tribulations of a multiracial 4th grader, starting regular school after being home-schooled her entire life. CN: What was it like growing up in the Wayans household? Kim: Amazing. There were 5 girls and 5 boys. I loved growing up with a big crazy family. We didn't have much in the way of material things, but we didn't need it with all the joy, love, fun and creativity. I didn't realize we were poor until I went off to Wesleyan University. I woke up one day and said, "Wow, we were poor?" [Laughs]. It's great having a family like that. CN: Where did you fall at in the line? Kim: In the middle, the forgotten middle child. But in a family that big, there really is no middle child! CN: Are the rumors true? Is "In Living Color" coming back? Kim: Yes! Keenan is doing a reboot of "In Living Color" with a fresh new cast. So Ms. Benita will not be blowing up the spot [Laughs]. I may make a guest appearance, but it'll be a new cast because the whole point of this is to help talent that's out there now — talent that doesn't have any place to showcase their skills. And the same way "In Living Color" served as a launch pad for myself and Jim Carey, Jamie Foxx and Jennifer Lopez — the list goes on and on. This reboot will do the same for a whole new generation. I'm also working on a pilot for a sitcom that I wrote with my husband and that my brother's executive produced. It's a modern day telling of what it was like growing up Wayans, and I play the mom of a large brood growing up in a NYC Project Development. It's from the mother's point of view, showing what it was like for she and my father to raise us there. Kim is super busy but she's active on Twitter. Connect with her there! Ladies, help Kim out! After the interview, we discussed her desire to try twists and twist-outs. She's never even created a two strand twist and I shared a few tips, but she wants to hear from you! How do you create your twists (wet, damp or dry)? How do you keep them from unraveling? What are your favorite products for hold and shine?